Using TV to Promote Positive Customer Experiences - Page 6 of 8 - Increase visitor satisfaction, social media followership, and the effectiveness of your business' marketing campaigns. If you have TVs in your business, you probably put them there for the benefit of your customers. But have your employees become the primary audience? TVs are a utility that fewer and fewer businesses are without. A growing number of locations with sit-downs or long expected waits have a TV somewhere within sight. With all of the TVs in businesses, an important question comes to mind – who chooses what’s on? It shouldn’t be your employees. Where’s the remote, and who is in control? This varies from business to business. In a setting like a bar or restaurant, the remote might not be available to customers. In a waiting room the remote may be within reach for people to choose what they want to see. A lot of businesses have an employee in control. That employee though may choose things he/she wants to watch over what the customer wants to see. The notion that people would want to change the channel at all illustrates that even with thousands of channels out there, it is nearly impossible to pick one that everyone will enjoy. People and personality types are as diverse as a bag of M&Ms, you won’t be able to please everyone by tuning into a channel that only caters to one or two colors. In order to appeal to the interests of all of your customers / visitors, you would need an all-inclusive channel that changes between content types often. The greater the diversity in content, the more people you can attract to watch your TV. A custom TV channel from It’s Relevant TV. IRTV runs diverse short-form programming designed with businesses in mind. In addition to its vast library of licensed content, the platform features space for businesses to promote additional services or specials that otherwise might go unnoticed. It’s Relevant is focused on customer retention. The service prioritizes the people who are in your business with the intention of getting them to come back more, and spend more. Unlike cable bills that are flat expenses and give nothing back, IRTV is designed to generate revenue through its engaging features and put money into your pockets. Remember: You didn’t hire your employees to watch TV. If they are in control of your televisions and watching “their shows” you are likely doing your customers and your business a disservice. It’s Relevant TV can help you put meaningful programming on the TV to keep customers engaged, and make you more money. To understand the kind of return on investment you can expect in your business, follow this link to our: ROI Calculator . Profanity, graphic imagery, and other questionable content is present just about everywhere you look. It’s in the news, your favorite TV shows and movies, and &#@% it if it isn’t in this sentence. But not in your Family-Friendly Business, Right? Profanity and other such explicit materials are, for the most part, censored on network TV. This is thanks to FCC regulations. But all networks, especially the cable ones, are starting to push the boundaries a bit. And as they do, you run a greater risk of showing things that may turn off your customers. Now after a warranted spit-take you might ask yourself, “how did this happen?” – It’s the afternoon and not only are bad words being spoken, but they are also being written on the screen. Jake Tapper, the CNN anchor and host of this segment did warn viewers saying “We have to warn you some of the language you are about to hear is explicit and might be disturbing…” But what can your customers do? Tell the kids to “look away” or just leave the room entirely? It’s 4:52PM in the afternoon and they are stuck, watching something you never intended for them to see. It’s unlikely that any respectable business owner would willingly show a story with such strong expletives, or profane content to his or her visitors – but that’s the risk of running cable television in your business. You don’t know what’s going to come on. 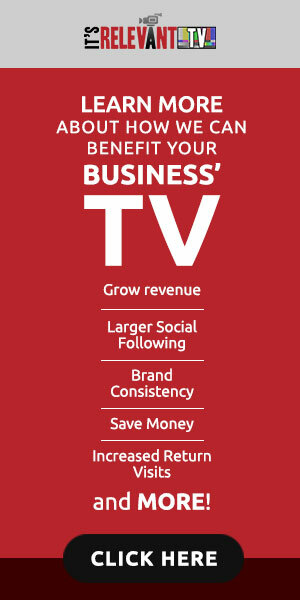 It’s Relevant TV is the cable alternative for businesses. It gives you control over what plays on your TV. It’s a service designed for your business televisions. Our vast living-library of television content is risk-free, filtered, and family friendly – you don’t have to worry about people being exposed to anything you don’t want them to see. Even the daily news that’s delivered is done so without the blood/guts/gore that we see more and more on network TV. You control what content your visitors see based on which categories you choose – all while educating them on services you offer and getting them engaged with your social media.